Huchuy Qosqo (small Cusco) is situated above the Valley of Urubamba and offers very spectacular views over the mountain range Cordillera de Vilcanota. you'll walk along ancient pathways and visit local communities where you'll be immersed in the culture. Huchuy Qosqo offers an interesting mix of pre Inca and Inca architecture and is set in a beautiful location overlooking the Sacred Valley. This trek is also a great way for you to enjoy a shorter trek that still includes Machu Picchu and Inca trails (with Inca stairs that are better than the Inca Trail). Collection from your hotel around 6.30 in the morning and take you up to Tambomachay (3765m/12425feet). Here is where we will begin our trek, heading up to the mountainside for about 2 hours until we reach the first pass of our hike (4100m/13530feet). From here you will be able to enjoy the views of Cusco city spread below you. After resting we will star descending into the next valley where we will visit a small village known as “Quesser Grande” before heading back up the opposite side of the valley again for 2 hours to reach our second pass and the highest point of our journey (4300m/14190feet). From here we will descend to Lake Qoricocha (Golden Water) and follow the path which will take us to our campsite at Qenko village (3900m/12870feet), this day there is the possibility of seeing Andean geese, falcons and maybe some hummingbirds. We will start the day early, breakfast 6.30am. After breakfast your guide will take you to visit one of the local families to see and have the experience of their lifestyle and culture. After you’ve visited the family you will have the opportunity to buy some handicrafts and then we will set off for our day. Today is an easy walk; we will walk for about 1 hour and arrive to an original Inca trail which will take us to Huchuy Qosco. 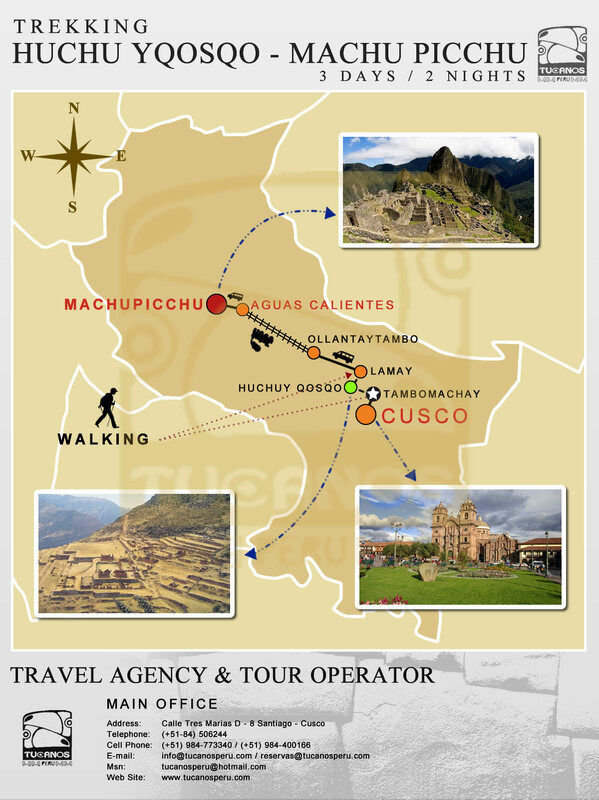 We will walk for about 1 and half hours through the beautiful valleys before arriving at Huchuy Qosco itself. Your guide will give you a tour around for about 1 hour and then you will have lunch here and a chance to explore by yourself. After we’ve finished up in Huchuy Qosco we will head down to the Sacred Valley via an Inca stairway, we will go down the steps for an hour and a half and finally arrive to Lamay a village in the Sacred Valley where we will board our bus to take us to Ollantaytambo. From Ollantaytambo we will continue by train to Aguas Calientes where we will spend the night in a nice hotel. DAY 03: Aguas Calientes – Machu Picchu - Cusco. We will have early breakfast. Then at 5:30 am we will catch the first bus to Machu Picchu (navel of the world) in order to appreciate the magnificent city as the sun is rising. A walking tour (approximately 2 hours) is given by your Guide and after this you can explore the mysterious city by yourselves. If you still have energy you can also climb up Huaynapicchu (2720m/8980feet) it takes 45 minutes to reach the top. We can also secure your entry to the mountain of Huaynapichu from where we can appreciate Machu Picchu from a different vantage point. Later, we will again descend to Aguas Calientes town to take the train return to Ollantaytambo and then by bus to Cusco, and transfer to your hotel.